The popular local journalist passed away peacefully with wife and childhood sweetheart Norma by his side on February 8 at the Cairnie Lodge in Arbroath, where he had been living during the last couple of years. Born in Dundee on June 16 1936, Alastair grew up in Broughty Ferry. He went to Eastern Primary School and then Grove Academy. Soon after leaving school he joined DC Thomson as a reporter. He also received journalism training in the RAF as part of his national service. With the exception of this, and a short spell at the Daily Express in the early 60s, Alastair spent his whole career working at The Courier and Evening Telegraph. He and Norma married in 1964, both aged 27, and moved to Carnoustie the same year to start a family. His long and distinguished career included interviewing Margaret Thatcher during her premiership. Most of his working life was spent in the Bank Street offices, before the DC Thomson staff moved to the Kingsway offices. After decades as a reporter and chief reporter, Alastair became deputy editor of The Courier for the last five years of his career, before he retired in 2001 at the age of 65. The grandfather kept on top of the news even after his retirement, buying at least three newspapers a day. Alastair was a sports enthusiast, both as a spectator and participator. Among the sports he enjoyed were golf, badminton and swimming. He also regularly went to the gym and enjoyed photography. He generously gave blood regularly, as he had the rare AB negative blood type, and was awarded a badge thanking him for donating so much. Alastair enjoyed a glass of wine, and made a “great, but strong” sangria. He also loved sunny holidays and a good laugh. He is survived by his wife Norma, two daughters Tracey and Sarah, and grandchildren Claire, Scott, Rachel and Nicole. His funeral will take place in Parkgrove Crematorium, Friockheim, on February 14 at 9.30am. All family and friends are invited. 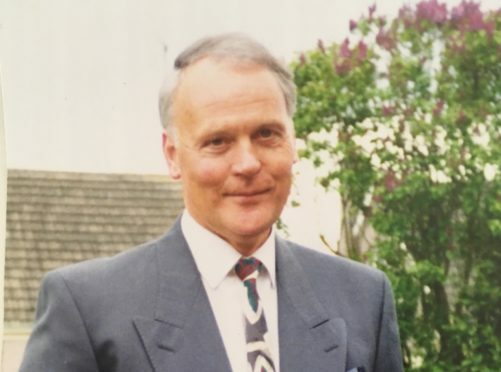 Alastair suffered from dementia in the last few years of his life and the family have asked that donations be made to Alzheimer Scotland in lieu of flowers. A reception will take place in the Station Hotel, Carnoustie, after the service.